contains guarana extract and caffeine – it can replace a cup of coffee! You need support during your work-out? Niacin, thiamine, vitamin B5 (pantothenic acid), vitamin B6 and vitamin B12 improve energy metabolism*. Vitamin C helps in the proper functioning of the nervous system*. 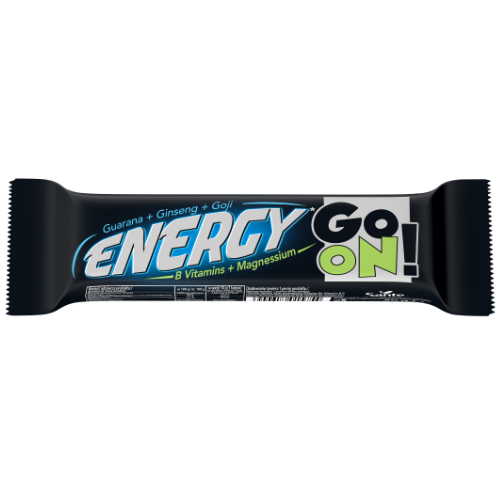 GO ON nut-caramel energy bar has a composition and taste that deserve a medal! 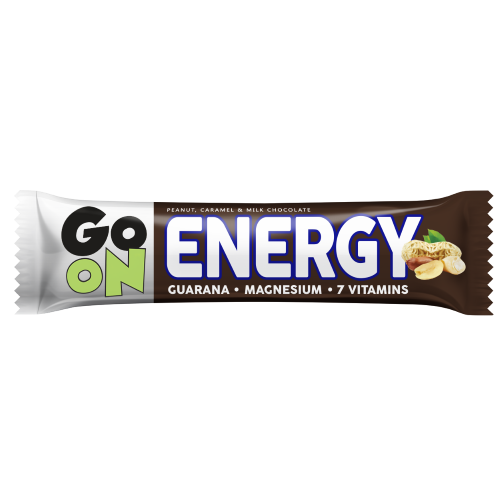 GO ON nut-caramel energy bar is a healthy snack, which you can enjoy either during or after your exercise, and in any time of an actively spent day. GO ON – always forwards! 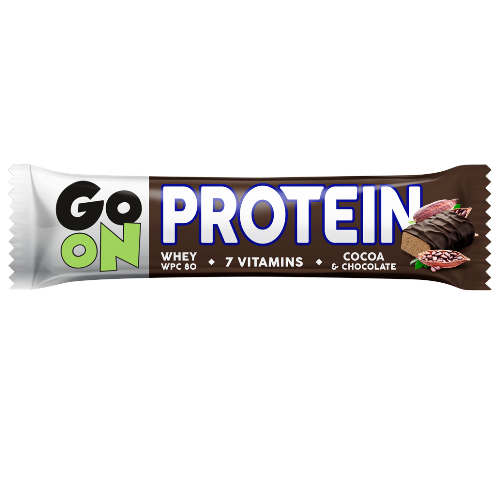 * A portion of 50 g (one bar) consumed regularly as part of a properly balanced diet and a healthy lifestyle will help you obtain such a health effect. Peanuts 25,5%, milk chocolate 25% (sugar, cocoa butter, whole milk powder, cocoa mass, anhydrous milk fat, emulsifier: lecithins (soy); natural vanilla flavouring), glucose syrup, flour: rice, corn; humectants: glycerol; maltodextrin, unrefined cane sugar, sunflower oil, caramel 2,4% (glucose syrup, sugar), skimmed milk powder, sea salt, natural flavouring, emulsifier: lecithins (soy); enriching substances: magnesium citrate, vitamin C, niacin, vitamin E, pantothenic acid (B5), vitamin B6, Thiamin (B1), vitamin B12; guarana extract 0,5% (maltodextrin, natural guarana extract, natural caffeine 0,05%).